The studies are based chiefly on the studies of motors with plastic propellant charges of maximum length 25 ft and maximum diameter 3 ft 6 in. 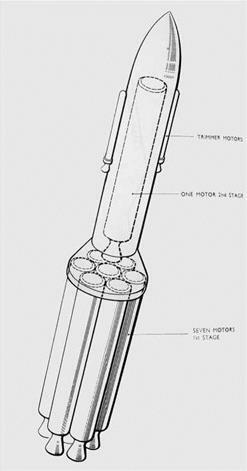 These maximum dimensions are considered feasible with radial burning plastic propellant charges… and are within the pressing limits of facilities already planned and requested… For a missile carrying a 4,000lb warhead, fitted with clustered motor units, the ranges calculated for single stage and two stage propulsion are respectively up to 1,300 miles and up to 2,500 miles. Not surprisingly, given the lack of experience with solid fuel motors of such size, the report is somewhat lacking in precise detail, but instead takes various arrangements of mo tors and makes an estimate (or guess) at the range obtainable from each one. The individual motors shown in the sketches are also very generic: other than being 3 ft 6 inches diameter and 29 ft 2 inches long, there is very little information about them. Quite why these particular dimensions have been chosen is not obvious. It is clear that the option of using solid fuel motors was not taken very seriously – there is no mention of them at all in policy papers, and it is quite possible that the study was undertaken so as to be seen to have covered all possibilities. It does not appear from the report that there had been wide consultation with those who were actually producing solid fuel motors – the limits imposed on the dimensions seem to have been rather arbitrary. Certainly there is no discussion of the degree of practicality of building motors as large as these or larger. been worth revisiting some of these ideas. Unfortunately the idea of a liquid fuel missile had become too firmly entrenched by then – which is, in many ways, a pity. For comparison, let us look at the American solid fuel Minuteman missile. through its exhaust flames and not be significantly damaged’. The system was approved in February 1958 and the first successful launch was in February 1961, when the re-entry vehicle travelled a distance of 4,600 miles. Its design range was 5,500 miles. The first stage was 65 inches in diameter and 22 ft high; the whole missile was 55 ft tall – in other words, shorter than Blue Streak, almost half the diameter, a third of the weight, and it could deliver its payload near three times as far! The warhead yield was 1.2 MT and the re-entry vehicle plus warhead would have weighed in the or der of 1,000 lb. Even though the US was considerably ahead in the design of solid fuel motors, developing a British solid-fuelled missile would have been quite feasible, and probably no more expensive or time consuming than developing Blue Streak, but the idea was taken no further. The thrust control issue arose from the use of large rocket motors: towards the end of the flight, when almost all the fuel was consumed, accelerations became unacceptably high. Thus there was a proposal to throttle back the motors: not an easy task. The firms detailed to do the work had been decided back in 1955. It is proposed that Messrs de Havilland should be responsible for the airframe and general weapon co-ordination, Rolls Royce for the rocket motor and fuel system design, Sperry for the internal inertial ‘guidance’ and autopilot, Marconi for the ground radar launching system. To be fair, we are not given de Havilland’s views on Rolls Royce! The equipment is required to reproduce that used by Convair for the production of the same type of pressurised structure for an American Ballistic missile. This type of structure is unique to Ballistic missiles and consists of a series of rings in stainless steel and seam welded. These rings are then welded together and fitted with stainless steel domes to form the main tanks for the liquid oxygen and kerosene. The resulting structure is of such strength that it must be kept under pressure in order to retain shape. This very light structure and the method of production has been developed by Convairs over a very long period (5-10 years) and to save time is to be copied by De Havilland. So important is this feature of the ‘Blue Streak’ programme that it has been decided that the British missile shall have the same diameter as the American one. This means that the tools, jigs and fixtures can be reproduced with the minimum loss of time – a most important feature as the first structure is required by mid-1957. Sir Cyril Musgrave, of the Ministry of Supply, came to see me on 14th November , to talk about the Medium Range Ballistic Missile. His primary objective was to talk about Spadeadam, and when I told him the Chancellor had made a decision, the main point of his visit was lost. However, he did say that the Ministry of Supply was having great difficulty in holding De Havillands at arm’s length, particularly now that the American Government had approved the contract with Convair. The transaction being referred to was the licencing by de Havilland of the technique for building the tanks – the decision had been taken to use the same construction method as the Atlas missile, with its ‘balloon’ stainless steel tanks. The passage about Musgrave is, on the face of it, extraordinary – the Ministry of Supply was simply a procurement ministry, and was not supposed to decide military policy. It demonstrates how blurred the lines can become at times. This is a proposal that de Havillands should buy from the American Company Convair some ‘knowhow’ for the development and production of a British intermediate range ballistic missile (Blue Streak). This knowhow will cost $700,000. This is misleading in so many ways that it is difficult to know where to begin. A halt in atomic tests would not make the slightest difference in the military need for a missile, nor would the amount of fissile material. The Americans might have given the UK the ‘know-how’ free (unlikely, and that avenue had probably been explored already), but not all the $700,000 was just for ‘know-how’ – it included specialised welding equipment for the tank sections. (i) we can drop the whole MRBM project. This would mean either that we ceased to contribute actively ourselves to the strategic deterrent or that we did so only during the lifetime, now relatively restricted, of the bomber. (ii) we can proceed as at present, buying (with the US government’s permission) what American information we can, but in the main relying on our own brains and effort (but knowing we are far behind both the Americans and the Russians in the ballistic missile field). This is an extraordinary memo. First, it recognises the dilemma that would face Whitehall for the next four years: no missile, no deterrent. In practice, the Treasury would have been more than happy to abandon the deterrent – in the mid-1960s, it thought it had succeeded. (The Foreign Office and the Ministry of Defence were described by the Treasury at one stage as the ‘last two remaining retentionist [sic] departments’. It was the politicians of the Wilson Government that wanted to keep British nuclear weapons.) The other extraordinary feature is the way the Americans are regarded as some kind of fairy godmother. There were no ‘rights or wrongs’ in this case: there had been some controversy with regard to nuclear information in the 1940s, but that certainly did not apply to missiles. The word ‘sponging’ comes to mind on reading memos such as these. The outcome of the Suez debacle was a further rethink in defence policy under the new Prime Minister, Harold Macmillan, who appointed Duncan Sandys as the new Minister of Defence with increased powers. Part of Sandys’ policy rested on missiles and nuclear weapons, which should have made Blue Streak more secure – although, paradoxically, this proved not to be the case. Rolls Royce initially copied the S3 design and then refined and anglicised it, so that the motor could be built with purely British components. The S3 was being developed for the American Thor and Jupiter missiles, having evolved from the original V2 design via the Navaho missile. This motor burned kerosene and liquid oxygen, standard for the time, but a combination that might, in retrospect, have appeared out of date by 1960, although this is still a matter of controversy. A copy of the design, designated the RZ 1, was built by Rolls Royce and tested at Westcott. From this, the anglicised design, the RZ 2, evolved.